Key stage 1 and 2 students are at an age where Outdoor Learning opportunities can shape their view of the world around them. Our aim is to educate children through our activities and field studies programmes, linking adventure and discovery to the National Curriculum. Children learn quickly in such an engaging and challenge driven environment, building character and progressing in a surprisingly short time when given new opportunities. Each individual is challenged and stretched by our qualified instructors, as they work towards increasing initiative, commitment, personal responsibility and self-motivation. All of our activities are run with a personal development approach and 'Challenge by Choice' means that sessions are voluntary and individuals will not be forced to take part in any activities. Our instructors ensure that every child works within their own personal ability levels and are encouraged to challenge themselves appropriately. At Avon Tyrrell, we work closely with you during the development of your programme to ensure that your sessions help you to deliver the National Curriculum goals related to your subject. At KS1 and KS2, we encourage young people to explore the world around them, develop a growth mindset and feel confident in themselves and their abilities. English and Maths are a embedded within all our sessions, with Field Studies covering a wide range of subject content such as Science, Art and Geography. 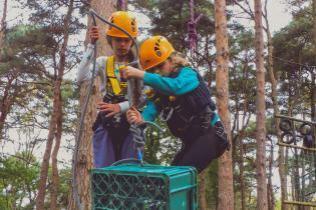 "Activity Centres often fail to live up to their glossy brochures, but Avon Tyrrell was outstanding. Having just returned from a week away with Year 6 pupils, it is safe to say the centre is fab in every way. The instructors are fantastic - great communicating with tired kids, but safe and fun, the lodges are spotless and comfortable and the food is homemade and delicious. This is our school's third stay and it certainly won't be the last. Thank you for making so many happy memories."